– SHoP Architects, Dunescape, for the 2001 MoMA/P.S.1 courtyard competition. – Álvaro Siza and Eduardo Souto de Moura with Cecil Balmond, 2005 Serpentine Pavilion. — Zuloark Collective, el Campo de Cebada, Madrid, 2010. 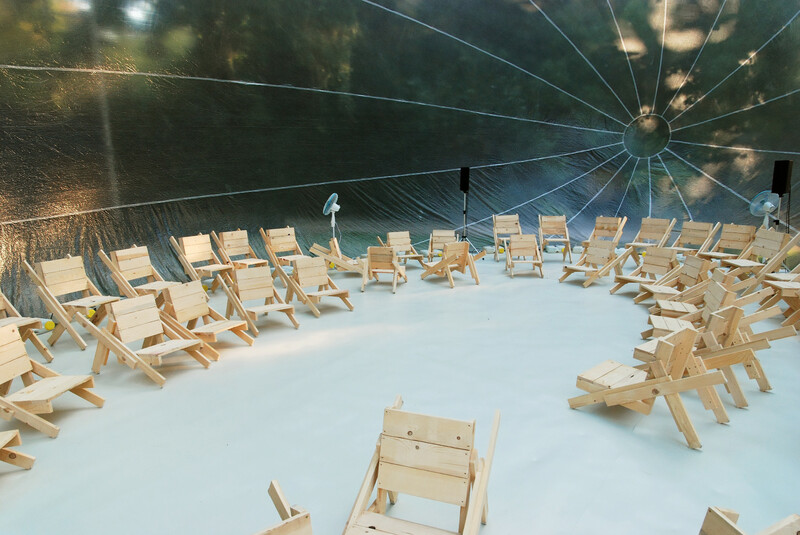 Two of these projects involve the deployment of digital design and production techniques to create platforms for small-group conviviality, nestled inside larger spaces generally associated with high culture and the flows of capital that support it. 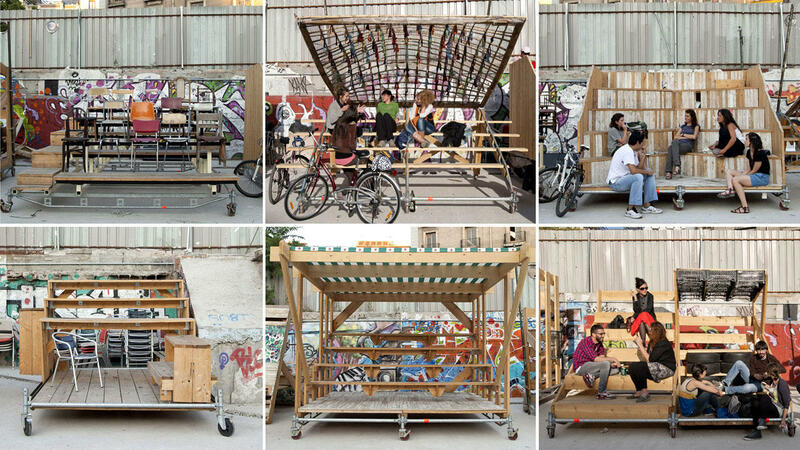 The other two involve the use of low-end, commodity material to create platforms for face-to-face deliberation and the practice of democracy (as well as conviviality), deployed in marginal, interstitial or outright occupied spaces. The appearance of a parallel evolution in these admittedly cherry-picked examples may say more about my wishful thinking than anything else. But it seems to me that there’s clearly something going on here, in the convergence of sophisticated digital design, on-site fabrication and software for the near-real-time user configuration of space in what we might call lightweight placemaking. In all of these projects, we see an emphasis on rapid mountability and demountability, and the mobility and highly sensitive user control they afford. We see high technique brought to bear on utterly commodified, widely available, broadly affordable (even free) materials. And we see these things used to bring people together, both to enjoy one another’s company and to discuss such matters of concern as arise before them. There’s an especially lovely symbolism to the use of such humble materials in making the place of democracy, and if the use of commodity lumber doesn’t involve quite the same material rhetoric as the use of marble in the ennobling public spaces of the late 19th and early 20th centuries, well, neither is the public being invoked the same. 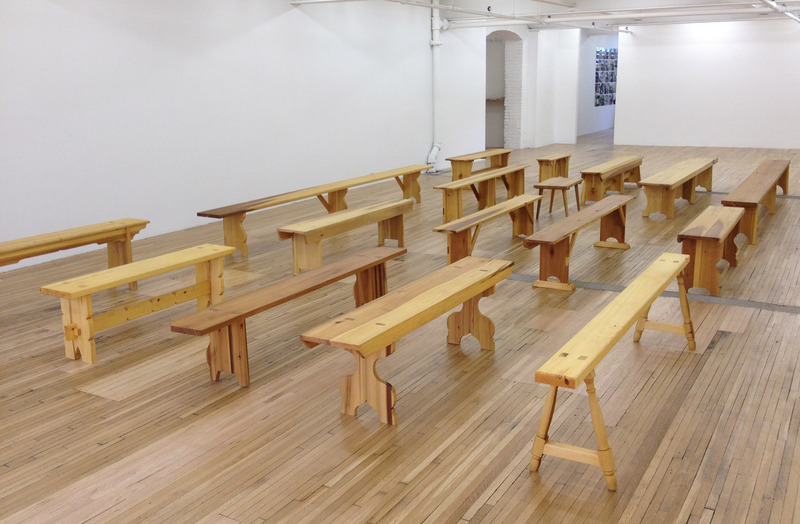 — SEE ALSO: Francis Cape’s We Sit Together, a history of the wooden bench in the American intentional-community tradition. Image courtesy Murray Guy Gallery. I’d argue there’s at least one crucial difference: in most of the projects above, there is space, and there is movable furniture within the space; but in the SHoP Dunescape, nothing is able to be moved by the user in real time. In fact, the Dunescape project, using Maya, a piece of animation software, implicitly claims to have already anticipated all possible future user movement and interaction with the hard architecture, in advance in the virtual time of the computer model. The shifting surfaces are designed to be affordances that accommodate user interaction, but once the model has been run and output onsite, no new unanticipated interaction is afforded by the space. You can’t do like the people in the Holly Whyte video like to do: you can’t move the chairs. ETA: The mobility of the whole is an important aspect of all this for me, in that it suggests that democracy can and should happen anywhere. Well it’s a common critique of Parametricism, that it seeks to anticipate all possible flows in advance, and then hard-codes those assumption into solid form and space. The ideology says that virtual time is enough. Oh, believe me, I share that critique. As you know. The deeper problem I have with this whole direction I’m suggesting is that even at its most flexible, it’s overdetermined. Like, I was at a community meeting last night that required nothing more by way of a physical platform than a room and some old school chairs and tables. That’s the most economical thing of all, right? To squeeze yet more use out of things for which the energetic investment involved in their manufacture was made a long time ago. But for the desire to harness the aesthetics of accessibility, I find myself questioning why democratic practice ought to involve the creation of yet more new spaces and objects when there’s life in the old ones yet.